I created this fabulous berry and leaf necklace in a class several years ago with beading artist Stephanie Eddy. It was great fun. The necklace is now available for sale on my Etsy shop: HTQSBagsandBeads. Beading is something I LOVE to do, but have very little time for these days. 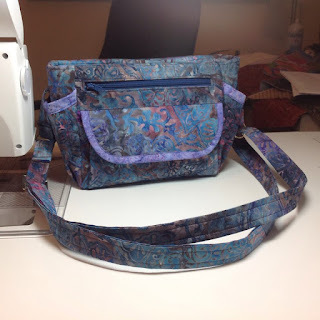 Sewing for bag orders in the Etsy shop has been keeping me very busy. Not that I'm complaining. I'm just whining a little about missing playing with shiny little beads! LOL. Below is a pic of my latest customer order. It turned out great and I'm very happy to report the customer has seen the pic and loves it. As we speak it is on its way to its new home in New Hampshire. We are a quiet household this morning. I was up until the wee hours working on a customer quilt (finished the quilting at the stroke of 1 a.m.!). It always takes me about an hour to wind down and get ready for bed. I'm tired today. Hope to shake it off and get productive! The kitties are not helping me feel motivated...Kaboodle is on the window sill watching the birds and Kit is stretched out on the sewing table. He is getting so big that means he is pretty much covering every inch! I'll have to relocate him to this computer chair when I get ready to stitch. On today's agenda are more of the bionic gear bags. I have two orders pending and several more to put together so they can get posted on Etsy. I have an order for several zipper pouches, two lunch bags, two shoe bags, and an upcoming customer quilt. Plus, I am waiting to hear from a customer about the final wording on a label. Hope your day is peaceful and full of the things that make you feel good. Too wet to do anything but sew.. This was on FB today. I love it. As you probably know from the news, we have been inundated with rain. I should have kept track but I think there has been rain practically every day during the whole month of May. During last night our cell phones went off 4 different times with weather warning tones. There is widespread flooding. Snakes are coming out of their...what are they called...dens? lairs? snakeholes? I have yet to encounter a large Texas snake but I know they are out there. UGH. While normally I would be thinking about spending this holiday weekend at some BBQ event, instead I am content to stay inside and sew. All in all, a nice way to spend the day! Happy May Monday! I can hardly believe that the middle of May has passed, my good friend Claudia from Massachusetts has been here for our annual retreat, and my sister Barbara has visited and flies back home today. Having people visit is so fun. But now it's time to get back to the real world. As I noted I am now a "shop owner" on Etsy. HTQSBagsandBeads is the name of my shop and I sell...well...bags and beaded items!! Imagine that! But that's not all. Over time I plan lots of goodies in the shop, including machine embroidered items, holiday decor, etc. The list churning in my mind goes on and on. The trick will be squeezing everything I want to do into the number of hours in a day. Pictured above are two items I currently have in the shop. The first is a really wonderful medium sized bag with logs of pockets and slots for cards, keys, phones, and all the other stuff we like to carry with us. Some of the pockets are open and others have zipper closures. For more pics, please visit the shop on Etsy. The second item is a lacy necklace I made some time ago. It is from a pattern by Sandra Halpenny (LOVE her designs) and I made it in soft green seed beads and two different shades of fire polished rounds. I was surprised to see how much the rounds along the inside edge really show up in this photo...cool! Of course there are more details about the necklace on the shop site. I hope your daily schedule today leaves you some time for a bit of creativity in whatever manner you most enjoy! No blogging, but I've been busy! I was looking back over previous blog posts and discovered I haven't written anything since last July! Almost an entire year has gone by with no blogging. I think about blogging often, but somehow it never seems to happen. I intend to be much more regular with my blogging, but in the meantime if you want to check out my shop the name is HTQSBagsandBeads. HTQS stands, of course, for Heritage Trace Quilt Studio, and Bags and Beads because that is mostly what you will find there. However, my items will not be limited to just those two categories...I will be selling many types of items there, including a variety of pin cushions, American Girl -type doll clothes and accessories, and sewn home decorating items. Check back often...you never know when something new might pop up! I recently quilted this antique Grandmother's Flower Garden quilt top for a customer. It had been made by a family member and left unquilted for decades. Many parts of the top were not able to be saved, but what remains is a good sized piece that can lay at the foot of a bed. This top was very interesting to work on as the maker did a very conscientious job of matching the colors for each of the medallions as well as endeavoring to fussy cut and center motifs in individual hexagons. Unfortunately, there are numerous stains on the piece that cannot be removed, yet the little top will surely bring a sense of continuity to the family that owns it. I was able to share tips for its future care and hope that it will be around for decades to come. I have to admit that it is always with a bit of sadness that I send a quilt off with its owner. It has been in my house for a while and when it is gone I miss it. YEARS ago I hand quilted a Grandmother's Flower Garden top for a co-worker, after tea-dying some fabric to match some areas that needed to be repaired. That quilt was a true treasure when it left my hands...I am proud to say so. I definitely didn't want to give it up! Recently I quilted a top for a relatively new quilter. It was an anniversary gift for her husband. When she came to pick it up I was able to share some pointers with her as well regarding a few things she might try differently next time (e.g., she didn't know she should trim the selvage away from any fabric used in a quilt, etc.). I was excited for her in knowing that she was giving her husband a symbol of her love for him that she had made with her own hands. In addition, I think she will be a repeat customer and I eagerly look forward to her the next project she might bring to me. I have a potential customer coming soon and am looking forward to discussing her quilt with her and the quilting options. It is her first quilt and no doubt she is both nervous and excited. I hope she doesn't get drenched. I love rain. I don't know if it is because I was born in April, but I have always loved rain. I love the sound of it pouring from the sky as it is now and I love the quiet when it lets up a little. I love being inside and watching it wash the dust away outside. I love sleeping while it rains. I love the smell of rain and the way it changes how the ground smells. The smell of the wet earth always reminds me of my maternal grandmother, who loved to grow roses, and of my mother, who calls flowers food for her soul. I even love the thunder and lightening that can come with rain as I admire the power. Having grown up in Iowa I can say I'm not that crazy about the wind that can accompany a rainstorm, having been taught early to beware of the possibility of tornadoes forming during inclement weather. I think having moved to North Texas almost two years ago has made me appreciate rain even more. The magic that can happen when a normally dry area gets a good amount of rain is astounding. I was watching the news last night and they were showing scenes of the California drought. I couldn't live where it is so dry. 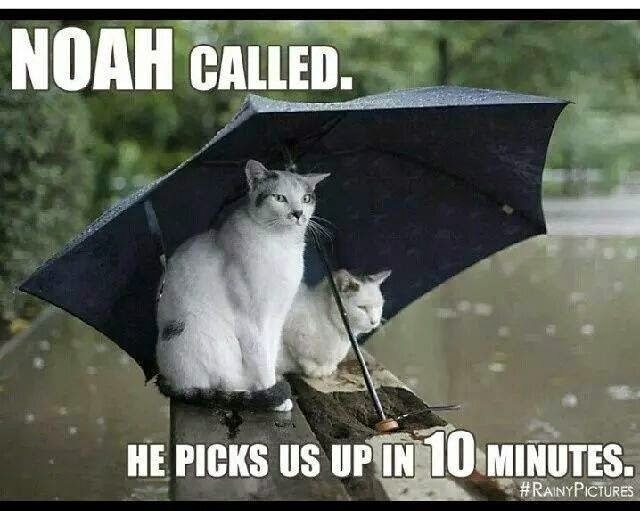 I need the rain. I suppose I might feel differently if I had ever been in a flood, but I really do welcome rain. Especially when I can watch it from behind my sewing machine.